Nourish your hair at home with eggs. Homemade hair care treatments are a sensible and affordable way to care for your hair without harsh chemicals and damaging hair products. By choosing to care for your hair thoroughly at home, you take control of your beauty easily and confidently. Affordability: A custom blend of homemade ingredients is often far less expensive than salon hair products. Environmental Impact: Using organic, natural ingredients for home hair care treatments is more environmentally friendly than opting for highly processed products. Special Hair Needs: Individuals with difficult to manage hair may be able to create their own care regimen more easily than finding specially formulated products. Gentleness: Many times the natural ingredients used in home hair care are gentler on hair than the harsh chemicals in commercial products. Control: By making your own hair products and treatments, you know what is going onto your hair instead of guessing about the properties of mysterious chemicals and blends in other products. Frizz Control: Massage a small amount of coconut oil into clean hair to keep it smooth and luxurious. Adding Shine: For glossy shine, rinse your hair with lemon juice or a mixture of apple cider vinegar and water. Eliminate Buildup: To cleanse your hair of chemical buildup, rinse it thoroughly with a slightly foamy solution of baking soda and warm water. Eliminating Head Lice: Mayonnaise or a mash of basil and cloves have been recommended as effective home remedies for head lice. Treating Dandruff: Go flake-free with a mixture of equal parts olive oil and almond oil massaged into your scalp. Let the treatment sit for five minutes, then rinse the hair clean. Homemade Hair Gel: Avoid commercial hair gel by making your own with one teaspoon unflavored gelatin and one cup of warm water. Store the gel in the refrigerator. Homemade Hair Spray: Enjoy a citrus burst with homemade hair spray by cutting up one orange and one lemon and boiling the pieces with four cups of water. Boil until half the liquid has evaporated, then strain and pour the remaining liquid into a spray bottle. Store the spray in the refrigerator. Color Maintenance: A mixture of chamomile, yogurt, and lavender can brighten blonde hair, coffee can be used as a simple dye for brunette hair, and herbs such as sage and rosemary can be effective to help cover gray hair. 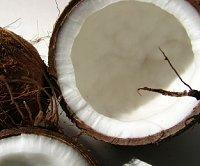 Coconut is great for your hair. Coating the hair with olive oil and covering it with a shower cap for five minutes, then shampooing. Mashing ripe avocado with coconut milk to create a paste to cover the hair. Let the mixture set in the hair for a few minutes, then wash hair. Combine two egg yolks with two teaspoons of castor oil until foamy, then massage into hair. Let the mixture dry in the hair, then rinse out. 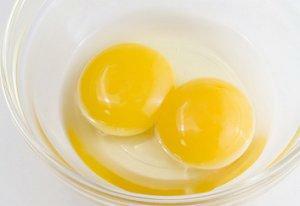 Combine one egg yolk with one-half teaspoon of olive oil and three-quarters cup of warm water. Leave the mixture on the hair for a few minutes, then rinse. Other homemade conditioner recipes may use herbs, fruits, oils, and other ingredients to create a soothing blend for your strands. Try several different types of home conditioning treatment to discover what works best to nourish your hair. Not only can you use natural products at home to clean, condition, and style your hair, but with a little practice you can also enjoy easy care hair styles without visiting a salon. Ponytails are a classic look that can be dressed up for different occasions, and if you know how to French braid you can create even more elaborate looks. Invest in a quality pair of haircutting scissors for simple trims and cutting away split ends, or purchase hair clippers to style home hair cuts. Do not use any recipes that include ingredients you may have allergic reactions to, even though you won't be eating the mixtures. Eat a diet for healthy hair to nourish your locks naturally from the inside out. Investigate other natural hair care tips so you can care for your hair effectively no matter what its challenges.